We’re at the start of a new year and with it comes a new set of trends for your lawn and garden. Trends are influenced through innovation and efficiency. Experts are always experimenting and implementing lawn and garden ideas that better sustain structure while providing a cosmetically perfect landscape. Drainage systems will forever be the trend that continues even after 2019. Effective landscape drainage keeps the appropriate amount of moisture in your garden while draining all the excess water away. French Drain systems are the nuts and bolts to most drainage systems in gardens, lawns, and patios. Another option to improving drainage efficiency is trench drains. Trench drains usually rest at the edge of pathways, patios, and even gardens. Landscape professionals use them in combination with French Drain systems as well. If you’re aiming for landscape cosmetics, consider digging a trench drain made of large river rock or gravel rock (spalls). These trenches provide a natural look that blends into the culture of the landscape while ensuring no standing water can damage your garden. You can never go wrong with installing something green in your garden beds. 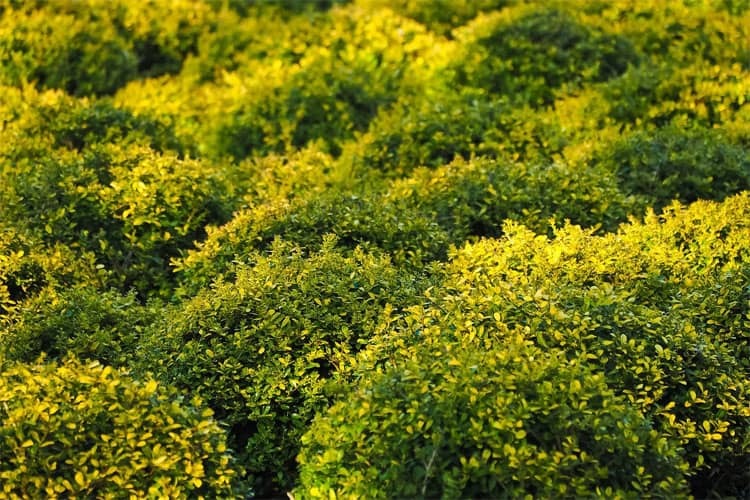 Evergreen shrubs and small trees will color your garden throughout the year. Mondo Grass – These plants are usually installed as a border on the edge of garden beds or a ground cover to absorb a deluge of water. Mondo Grass is great for rain gardens and pathways. They do require maintenance due to their rapidly spreading roots. Be prepared to remove them from areas where you don’t need them. Boxwoods – Like the grasses, boxwoods can serve as borders as well. Landscapers will plant them in proximity of each other. Overtime, their small branches will connect to neighboring shrubs which eventually create one large hedge. Or you can spread them out. Introduce boxwoods to annuals and perennials to keep color in the gardens all year. 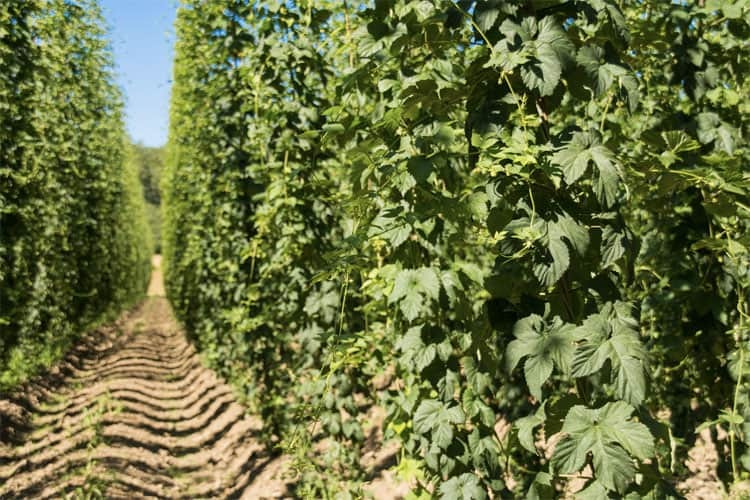 Hop trellis designs are common among those that farm their own food or food for the masses, but you can use hop poles like any trellis you buy from home improvement retailers. Twine any vine around garden wire to influence the plants to grow in spaces between neighboring hop poles. As vines (blooming vine, fruit, or vegetable) grow, allow them to hang. The natural, hanging garden expresses an exotic design to decks, pergolas, and trellis. Pathways all depend on your budget. 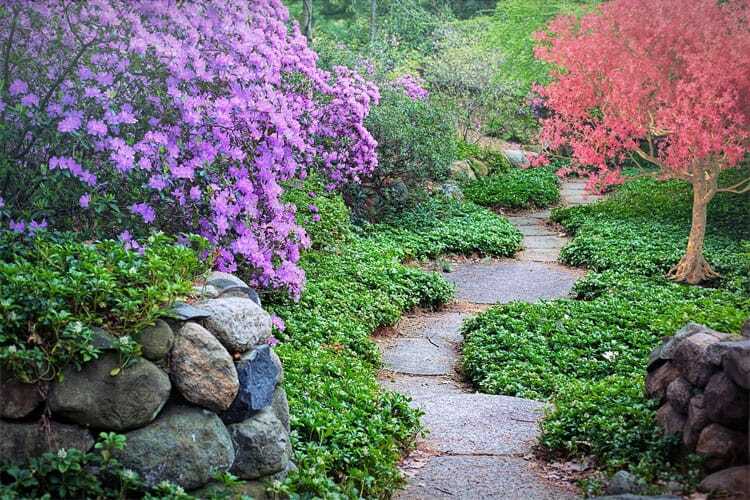 Constructed stone pathways, such as the kind you see with specialized brick or spalls, are long lasting. Pressure wash constructed pathways every year to keep grime from deteriorating the surface of constructed pathways. Loose stone or rock pathways are more cost efficient. They require less labor but requires the same amount of precision to make a leveled pathway. Loose stone pathways wash away overtime and need to be replenished with fresh stone or pebbles every six months or so. As you plan to install plants for the next season, prepare your garden beds. You can do this with various methods. Extract Leaves – If you live in an area where an abundant of trees are, prepare to manage the leaves that fall. Throughout the Fall and Winter, extract these leaves to keep your garden bed clear. Extracting leaves can deter bothersome insects like ticks and mosquitos. Mulch Leaves – Leaves in shaded areas can fight off weeds. Mulch them up with lawn mower and spread them around the garden beds. Soil Testing – Have your soil tested. Minerals from rain and other plants can cause different reactions to the soil bringing forth fungi and bacteria that disrupts the pH balance of the soil. In addition, do the same for your lawn. For enthusiasts and homeowners, consult landscape professionals for constructing brick and spall pathways. Get the advice of your local nursery to see what plants go well with hop poles. Also, vine harvesting farmers are familiar with hop poles and how to use them in any garden. Take advantage of native plants. See what green plants are versatile in your local area. Local plants fend off harsh weather conditions and survive flood waters better. And of course, don’t forget an effective drainage system. You don’t want your garden beds to saturated with water.